Just over 25 years ago, my life changed forever. The beautiful part was that I had no clue that it was going to, and I had no clue what a category 5 hurricane was. My dad told me we were going to ride out the storm inside the house and forego evacuation. I was 6 years old, so that sounded cool to me. All I knew was that I got to stay and board up the windows with plywood. Man, was I wrong. My family and I sat in our bathroom for 8 hours, listening to what sounded like hell swirling around us. The last hour of the storm was intense. My brother passed out inside the bathtub from a panic attack, and I literally thought he was going to die. No one should ever have to sit inside their house and listen to it getting destroyed…there were fire alarms going off, and the sound of glass shattering was everywhere. 2) He still loved me. 3) He was fully in control. I know I was only 6 years old, but the Holy Spirit had told me these things years earlier when I was singing “Our God Is An Awesome God” (Rich Mullins Style). I was four years old and was singing in a kids choir. Since then, I’ve never stopped believing those core truths. 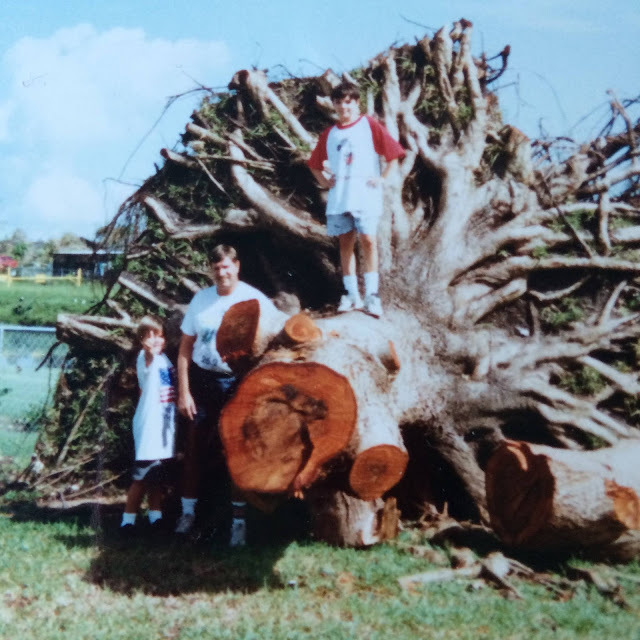 I’ve never seen such brokenness as I did after Hurricane Andrew. People were walking around the neighborhood like they had seen a ghost. Some were in denial. We didn’t think it was going to be this bad. Several people were hysterically crying and calling out to their loved ones and neighbors to see if they were alive and accounted for. It was then in that moment that I knew everything was going to change. It was never going to be the same again. I thought to myself, “Where are we going to sleep?” and “When or what are we going to eat next?” But I was too afraid to ask my dad. I’ll never forget walking back into the house and my mom yelling at me to get back outside for fear that the in the remaining roof was going to cave in. I was confused to see our basketball goal was gone. It had just been cemented into our driveway a few months prior for my birthday gift. About an hour later, we entered our house through the shattered sliding glass door. I checked on my room, and my heart broke. Everything was wet. Completely soaked. My electronics didn’t turn on and my baseball cards were water-logged. Pictures that were hung on my wall had disappeared, and the carpet was mushy. I started to feel panic seep into my heart, but I could hear my mom saying aloud multiple times, “It’s just stuff…It can be replaced. It’s just stuff.” She told me I was allowed to take one thing with me, but I had to leave the rest for insurance purposes. I turned to grab one stuffed animal off my top bunk bed and heard a whimper. Hershey! My puppy, Hershey, had somehow hid for cover on the top bunk. She had run away from us and refused to go inside the bathroom for cover. My heart was so relieved. I felt the love of God so deeply, and I began to cry tears of relief. Our cars had been destroyed, so my family and I walked to my grandma’s house. The crazy part was, grandma’s house had barely any damage. She only lived about 15 minutes from our house, which was no longer standing. She was safe, and we knew we had a place to sleep. Again, God’s grace and provision was evident in the middle of hurt. After several meals eaten by flashlight, bucket baths in an empty shower and late nights watching for looters, I finally got the courage to start asking my parents questions. I was informed that we were moving. My dad’s job was relocating us to a little town called Simpsonville in South Carolina. We were going to start all over. I was going to leave my school, my friends and everything I had ever known. I even remember my mom talking to me about the snowy winters in Greenville, and about their rollings hills that I could ride my bike through. My heart was aching, but I was beginning to feel excited. I believe that subtle excitement was God’s grace in my life. So why do I share all of this with you? I share this with you because I know exactly what you’re going through. I know the pit you feel in your stomach. I know what it’s like to lose everything. I also know God takes broken situations and does incredible things. Perspective is going to be key here. Now that I’m 32 years old and far removed from that time in my life, I see things so very differently. I had no clue that because of this hurricane, I would make lifelong friends at Southside Christian School. I had no clue that a few weeks after we moved, my mom would get me a drum set that would forever shape my life. I had no clue that I’d go to Liberty University to become a pastor, and in the process, meet my wife. I still look at my sons and think “They wouldn’t be here if it wasn’t for Hurricane Andrew,” and it makes my heart smile. All because God is good – He loves us and is fully in control. He knows what He’s doing. He sent Harvey and Irma because God is on the move, not because he lets bad things happen to good people, but because His ways are not our ways and his thoughts our not ours. And therein lies true peace. That’s where you find hope in the midst of chaos. True peace isn’t the absence of devastation, but is found when clinging tightly to Jesus in the midst of uncertainty. That’s my message to those who have been hit hard by Harvey, and those that are preparing for Irma. Let Jesus be your peace in the midst of sadness. Sometimes God lets our house and belongings get destroyed by hurricanes because he has something AMAZING in store for us. 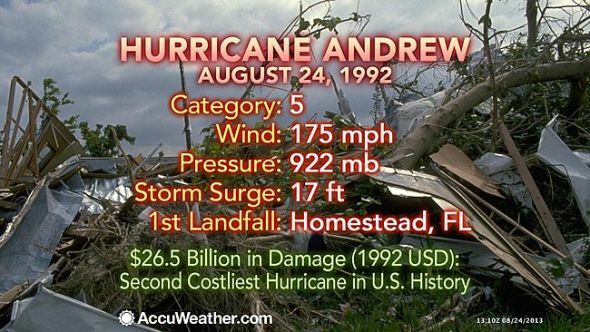 I have no idea what my life would look like today if that storm back in 1992 had never happened, but I’m so thankful it did. God is on the move. Rest in His sovereignty. Reading this as I eat canned spaghetti by tap light as we await power to be restored here in our neighborhood post IRMAGEDDON. Thanks for the encouragement. God is good!